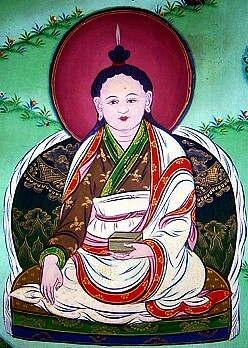 Rigdzin Gödem Ngödrup Gyaltsen (Tib. རིག་འཛིན་རྒོད་ལྡེམ་དངོས་གྲུབ་རྒྱལ་མཚན་, Wyl. rig 'dzin rgod ldem dngos grub rgyal mtshan) (1337-1408) — a major tertön who discovered the Northern Treasures (Tib. བྱང་གཏེར་, Chang Ter; Wyl. byang gter). He became known as Rigdzin Gödem because, at the age of twelve, three vulture feathers spontaneously grew from the crown of his head. When he was twenty-four, five more grew. Rigdzin Gödem literally translates as "Vidyadhara Vulture Feathers". He was an emanation of Nanam Dorje Dudjom and a previous incarnation of Tertön Sogyal. Dudjom Rinpoche, The Nyingma School of Tibetan Buddhism, Its Fundamentals and History, trans. and ed. Gyurme Dorje (Boston: Wisdom, 1991), pages 780-783. This page was last edited on 8 May 2018, at 08:42.